Out of sight; out of mind. But what if that nuisance we can’t see right now is likely to cause more than $1 billion in damage to the U.S. beef industry? It’s time to make horn flies top-of-mind. Yes, that tiny black fly – only about 4 mm in length or half the size of a house fly – causes a huge economic impact to the beef industry each year in lost gains and reproductive failures. Even though it only lives 10-20 days, it makes a lasting impression during its short lifecycle. Cattle producers need to take a proactive approach to their fly challenges to get them under control before they become such a burden. Waiting until they turn out to pasture or see a fly is too late. Although horn flies have such an incredibly short life cycle, they are active producers – a female fly can lay upward of 400-500 eggs in a fresh pile of manure during her life. Consider this. In week zero, only two adult horn flies might be present in your pasture, but due to warmer weather, available breeding grounds and their reproductive cycles, by week eight, there will be more than 114 Million flies of all ages present. Think about that and realize the importance of being proactive. The economic threshold is 200 flies per animal. If not controlled, some university studies show that horn fly populations can reach up to 1,000-2,000 flies per animal, which results in the huge economic loss to the industry. Horn flies are shown to feed up to 20-30 times per day. 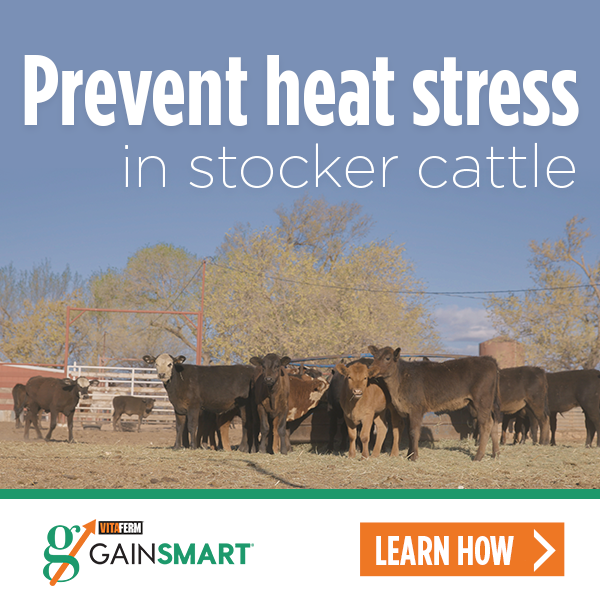 Blood loss is just one of the stressors that the cattle face. In addition, cattle will lose weight, milk production and conception rates can decrease. If sores are present, they can become infected leading to other health challenges. One of the best ways to prevent the spread of horn flies in your pastures is to feed a mineral with IGR added to it like VitaFerm® Concept•Aid® 5/S IGR or VitaFerm HEAT® IGR. The IGR is a feed-through that controls the flies in the manure at the larval stage. By making sure they never reach the adult stages, you are decreasing the number of future flies born and stopping the flies before they get old enough to bite and harm your livestock. “The number one reason IGR fails is because producers don’t think about preventing what they cannot see. Now is the ideal time to start feeding IGR to prevent major economic losses,” Glaubius said. 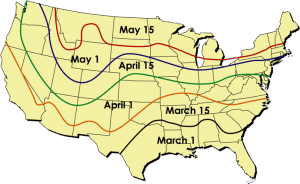 Horn flies have likely started their emergence in the South due to the warmer temperatures (see image). However, Glaubius encourages a dual-pronged approach to all fly-prevention to get the most effective control over the longest period of time. This might include feeding IGR and using a fly tag, feeding IGR and using a fly duster bag, feeding IGR and administering a wormer with known fly-control in it or a combination of any of these two. Studies have shown that calves with no form of fly control are on average 25 pounds lighter at weaning than those with some type of fly control. If you sell your calves for $1.80 per pound at weaning, that is a cost difference of $45 per calf at weaning, so your fly control will have at least at 3:1 ROI even if using two different applications. The VitaFerm mineral options with IGR are ideal for cow-calf producers because the IGR will prevent the breeding of the horn flies in the manure of the treated cattle. In addition, the Amaferm® found in all VitaFerm products will help combat the other stressors of flies while maximizing performance. Amaferm is a precision-based prebiotic designed to enhance digestibility by amplifying nutrient supply for maximum performance. It is research-proven to increase the energy available to the animal resulting in more milk production as well as to the ability to initiate and maintain pregnancy and fertility. For producers looking for a more natural way to control flies, the VitaFerm HEAT Mineral line is another great alternative due to the garlic. Garlic, considered a natural insect repellant, will not kill the flies, but it will help prevent the flies from landing on and biting your cattle. Small, but mighty. They may not be visible yet, but it is inevitable the horn flies will be on your cows soon enough. Why not get a jump start on getting them stopped before they outnumber everything on the farm? Start with a high-quality mineral program with IGR and be proactive in your fly control.